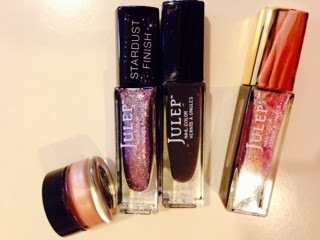 My love for Julep continues! I have to say that the Aisha nail polish (an awesome berry color) from my introductory box stayed on without chipping for at least six days: six days of laundry, dishes, endless hand washing, etc. LOVE. a little fuzzy, but this was after the six days! I also used the Julep top coat, so this could be a factor in it's staying power. I chose the Boho Glam again for my February goodies and had my first experience with real glitter nail polish. February box: makeup item was a cute cream eyeshadow in color of my choice, the two middle polishes I chose as part of the Boho Glam box, and the extra gift was the third polish. 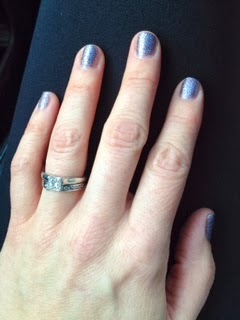 'Stardust Finish' is Julep's version of glitter polish - goes on so easily and it doesn't flake off. It doesn't stay on quite as long as the regular stuff, since it's rough texture catches on things more easily, but I got at least four+ days chip free. This month's makeup was a choice of shimmery eye shadow. I like the subtle and flattering color I picked, but it is a bit of a messy consistency to apply. And there's always a surprise fourth item, which was another more gold glittery nail polish which I have yet to try. I just chose my March box and I'm chomping at the bit for it to arrive. I switched it up and went with the 'Bombshell' box. I'm excited that the makeup item is a lip gloss, in a color that I choose. 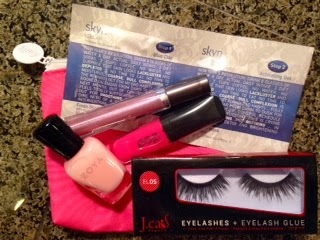 Which brings me to this month's Ipsy box, which was definitely my last. I cancelled the subscription yesterday. The gloss was nice but SO not my color, nor was the eye shadow. When it comes to makeup colors, I really think they need to adhere to the survey that members fill out upon joining. How is super hot pink gloss, purple eye shadow or false eyelashes anywhere in the realm of my preferred 'natural' look?? I do like the nail polish, and love doing facial masks, but I'd rather put my money towards the Julep box which I love, love, love. Did I mention I love Julep? Anyhoo! I have to talk about the Olympics, of course. The media has done their job well and completely sucking me I'm more of a summer games fan, but I loved watching slope style skiing and snowboarding, as well as the ridiculously awesome cross events. And, yes, any second that Meryl Davis and Charlie White are on my tv screen I tune in. No, I don't care how many times you tell me they've been skating together for 17 years - I need to see more! Here are some gorgeous pictures from Sochi. My husband got me a boot rack to put in our coat/shoe closet and it's a total game changer. I finally have some of this stuff in my life! I spent about an hour drooling over this new-to-me food blog, A Sweet Spoonful, the other day and want to make all. the. things. I also learned that she's a Seattle-ite and that I can stalk her and her granola in person! Awesome! This 24 hour music video is fantastic, and a great soundtrack for my day. Who doesn't want 24 hours of happy?? Speaking of tunes, I've added Ten Feet Tall by Afrojack featuring Wrabel to my current playlist - enjoy!